I attended a wedding at the Ritz –Carlton Marina 20 years ago and I remember thinking to myself back then, this place would really be cool if it were a little younger. Well, I got older and it finally got younger. They’ve moved away from their exclusive – country club vibe – to a younger, professional crowd. It’s not quite hipster young, but you get the feeling it very well could be if hipsters were a little older. The hotel sits on the rim of the man made marina, tucked in on Admiralty Way. The Lobby Lounge has been reborn. The décor is much more Restoration Hardware with lots of cherry red and mahogany. Classic art still adorn the walls and the gift shop is not really a place for real gifts. The staff still expects you to look and behave in a high-end kinda way. No sloppy drunks or sports bar volume type of conversations. No one’s going to regulate you; the atmosphere forces you to police yourself. The appetizer menu covers all the bases – from scallops to mini burgers and then some. Need a nice spot to write your plan on how to change the world or – maybe, a place to wait while the world changes? The lobby fireplace is the spot to loosen your tie or meet for a cocktail on a weeknight. Keep in mind – they still cater to the Louis XIII cognac crowd so don’t be fooled – when you visit, makes sure your wallet is very healthy. Yes! 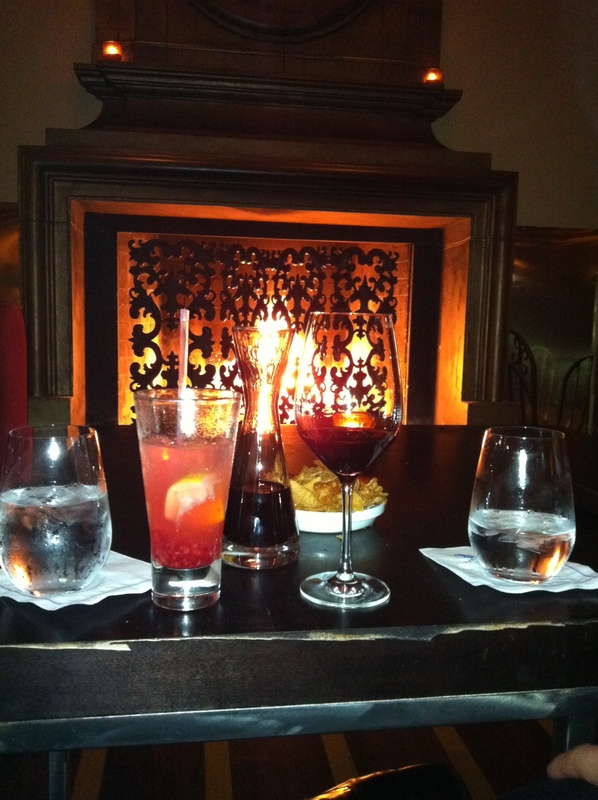 a full wallet is key and the fireplace is yummy! i loved sharing the cheeseburger with you.